To find out about more event, be sure to visit our Suggest an Event Bulletin Board to see what our readers have recently shared! Have an event to share? Feel encouraged to self-post community events here at any time! Serving Western Massachusetts since 2005, Hilltown Families supports development and enhancement of our local economy and community. Local businesses, individuals, schools, and non-profits are encouraged to partner with Hilltown Families through sponsorship and advertising. Let us help get the word out about your after school/homeschool class, event, camp, workshop, fundraiser, business/school, service, open house, volunteer opportunity or general announcement. Deliver your message to thousands of families living throughout the four counties of Western MA while supporting the community development work of Hilltown Families! Click HERE to find out more. Our community is rich in learning opportunities to supplement the interests of children, teens, and life-long learners. 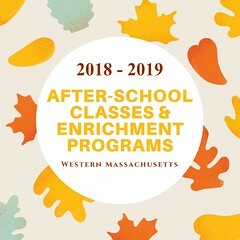 We have put together a directory of after-school & weekend classes and enrichment programs happening across Western Massachusetts throughout the school year. Many of these programs aren’t just for kids, so to all the adults out there – feel encouraged to pursue your interests and honor your callings through these enrichment classes, too! If you have a class or program you would like to have included in our directory, contact us at sales@hilltownfamilies.org to learn about our advertising options and sponsorship packages. Join Pioneer Valley Ballet for its Fall Session, September 10-December 1. PVB offers an 11-week ballet training program for ages 4+. A Beginner Modern class for ages 9-15 will also be offered, and Adult Ballet is held Sunday evenings. Visit www.pioneervalleyballet.org to register. Join PVB for its 40th anniversary of The Nutcracker from December 7-9. Community auditions will be held September 15 for ages 5-10. No dance experience necessary. Pioneer Valley Ballet is located in the Eastworks Building at 116 Pleasant Street in Easthampton, MA. 413-527-6363. The Movement Observation in Children and Adolescents (MOCA) study is a research study to improve how we measure physical activity using wearable sensors. Participation is Easy! All you have to do is live your normal life while you wear two small activity trackers and we record you using a video camera. Our research staff will come to you and work around your schedule. Anyone from 1.5-17 years old can participate. All you have to do is complete four 1-hour sessions. Receive a $20 Target Gift Card for participating. Have a parent or guardian contact Brett Gramann on how to get involved. Email: bgramann@umass.edu, call: 413-545-1583, visit: www.umass.edu. Hilltown Families Preschool Directory: Are you looking for a preschool that fits your child’s personality and reflects your family’s values? Check out our growing Preschool Directory, covering all four counties in Western Massachusetts, and find the perfect place for your young one! — Have a school you’d like to include in this list? Click here to find out how to have it added. ADVERTISE HERE: Reach thousands of families in Western MA while supporting the community development work of Hilltown Families! See your summer camp, class, community event, school, open house, audition, homeschool program, workshop, volunteer opportunity, wellness program, local business, after-school class, or non-profit featured here in the Bulletin Board section of our list of Weekly Suggested Events and in our weekly eNewsletter, reaching thousands of families living throughout the four counties of Western MA while supporting the community development work of Hilltown Families! Find out more about our advertising options and how you can partner with Hilltown Families in your online marketing by emailing us at at sales@hilltownfamilies.org. JOIN OUR TEAM OF CONTRIBUTING WRITERS: Interested in becoming a Contributing or Guest Writer for Hilltown Families? We welcome writings that reflect the community-building and educational efforts parents, teens, teachers, artists, activists and community leaders work towards and accomplish, and how that affects, supports and empowers our families. All writing styles welcomed, including local reviews, DIY posts, seasonal cooking/local food, and community-based educational & community service learning opportunities/resources. 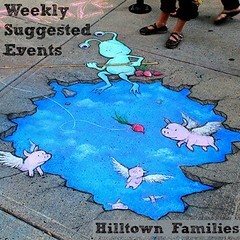 Send your query to info@hilltownfamilies.org. Click HERE to discover classes. Click HERE to find out about other community events. Click HERE to leave a comment about upcoming events. 9-10am – HILLTOWN FAMILY VARIETY SHOW: Tune in on your FM dial, or listen live via streaming audio at www.valleyfreeradio.org. Danny Weinkauf guest DJs our science and education episode, demonstrating though song examples and commentary his love of both, and how it has influenced his favorite songs and personal writing style. Encore of Saturday’s broadcast airs Sunday morning from 7-8am and podcast is posted here on Hilltown Families immediately following Sunday’s broadcast. Listen to the Hilltown Family Variety Show podcasts anytime. Click here select from over 10 years of archived shows! 7-8am – FAMILY RADIO: Valley Free Radio (WXOJ-LP 103.3FM Northampton, MA) airs encores of the Hilltown Family Variety Show every Sunday morning. commercial-free family radio. Tune in on your FM dial, or listen live via streaming audio at www.valleyfreeradio.org. Listen to the Hilltown Family Variety Show podcast anytime – click here to select from over 10 years of archived shows! Storyhour & Playgroups: Agawam, Amherst, Belchertown, Cheshire, Easthampton, Florence, Gill, Great Barrington, Greenfield, Hatfiled, Huntington, Lanesborough, Lee, Ludlow, New Salem, North Adams, Sheffield, Sunderland, Turners Falls, Ware & West Springfield. Storyhour & Playgroups: Amherst, Athol, Becket, Belchertown, Bernardston, Cummington, Deerfield, East Longmeadow, Erving, Granby, Greenfield, Huntington, Leverett, Monson, New Marlborough, North Adams, Northampton, Sheffield, Shelburne Falls, South Deerfield, Springfield, Turners Falls, Wendell, West Springfield, and Williamsburg. Storyhour & Playgroups: Agawam, Amherst, Athol, Belchertown, East Longmeadow, Florence, Gill, Greenfield, Hatfield, Huntington, Lee, Lenox, Millers Falls, Montague, Northampton, Sheffield, South Hadley, and Turners Falls. Storyhour & Playgroups: Amherst, Belchertown, Cummington, East Longmeadow, Easthampton, Florence, Granby, Great Barrington, Greenfield, Hadley, Housatonic, Longmeadow, Monson, Northampton, Pelham, Shutesbury, South Hadley, Stockbridge, and Sunderland. Hilltown Families’ list of Suggested Events is supported in part by a grant from the Belchertown, Buckland, Chicopee, Plainfield, Shelburne, Westhampton, and Worthington Cultural Councils, local agencies which are supported by the Massachusetts Cultural Council, a state agency.